Introduction: Hypertension is a chronic disease which necessitates daily medication intake and changes in the lifestyles. This may influence the quality of life. Aims and Objective: The aim of the study was to compare the health-related quality life of hypertensive individuals and age- and gender-matched nonhypertensive individuals in an urban area of Puducherry. Setting and Design: The cross-sectional analytical study was conducted as facility as well as community-based study. Methodology: The study involved 101 hypertensive patients attending the outpatient department of an Urban Health Training Center and 101 age- and gender-matched nonhypertensive individuals recruited from the community. The health-related quality of life (HRQoL) was measured using Short Form-12 (SF-12) questionnaire. The HRQoL was expressed in eight domains: physical functioning, physical role play, bodily pain, general health, vitality, emotional role play, social functioning, and mental health. The data were entered in Epidata software, and analysis with unpaired t-test was done using SPSS software for comparison of scores between the two groups. Results: The hypertensive individuals were found to have lower quality of life in both physical and mental domains compared to nonhypertensive individuals. The physical functioning, bodily pain, and general health domains of physical component recorded statistically significant difference. Conclusion: Hypertensive individuals have poor quality of life, especially in physical component domain in our study population. Hypertensive individuals merit a vulnerable population and need special focus by health-care providers in the context of achieving universal health coverage and sustainable goals. Nearly one-third of deaths globally are due to cardiovascular diseases (CVDs), a major contributor of mortality due to noncommunicable disease (NCD)., Hypertension is a major and important contributing factor for all forms of CVDs.,, Majority of deaths due to CVDs are from low- and middle-income countries like India. The prevalence of hypertension in India is about 30%, and the urban population had markedly high level of hypertension compared to rural population. Studies from South Indian cities reported deviations in rule of half related to hypertension., Of the high prevalence of hypertension (33.3%) in Pondicherry, less than half were aware of their hypertension status, and of them, only three-fourths were on medications. Studies on HRQoL are few from India and most of the literature is from Western countries. Considering the high prevalence of hypertension in our population and inadequate management, we planned this study to compare the HRQoL of hypertensive individuals and age- and gender-matched nonhypertensive individuals in a selected urban population of Pondicherry. This descriptive analytical study was conducted during the months of February and March 2016 in the urban field practice areas of a tertiary health care institution in Puducherry. The urban field practice areas included four urban wards attached to the Urban Health and Training Center (UHTC) of the parent tertiary care institution. The UHTC provides family folder-based comprehensive promotive, preventive, curative, and referral health services to a population of nearly 9000 residing in these four urban wards. Apart from providing routine care through outpatient department (OPD) basis, the special clinics are being conducted on specific days of the week by the UHTC. The NCD clinic is conducted on every Wednesday. Apart from providing routine follow-up and referral care during NCD clinic, the hypertensive patients and their accompanying persons are educated on various aspects of hypertension management including lifestyle changes. Yoga sessions are conducted by every Wednesday afternoon for all including the NCD patients under direct instructions of a trained Yoga instructor. A medical social worker is available on all working days for counseling on various aspects of lifestyle changes which include tobacco use quit and restrain from alcohol consumption. This descriptive analytical study had two groups. The study /hypertensive group included consecutive known hypertensive patients attending the NCD clinics of UHTC during the study period. Newly diagnosed hypertensive patients and hypertensive patients with a history of complications were excluded from the study. The comparison /normotensive/non hypertensive group included gender- and caliper age (±5 years)-matched nonhypertensive individuals from the community within the field practice areas. The matched individuals with any chronic disease were excluded from the study. The medical interns posted at UHTC were trained on research protocol and data collection methods by the senior resident from department of community medicine of the parent tertiary health care institution. The study participants were approached and interviewed after taking verbal informed consent by trained medical interns under the supervision of resident doctors (the investigators) from community medicine specialty. The study group was contacted at the UHTC and comparison group at their respective house. Privacy and confidentiality were ensured during interview and maintained afterward. The study tool had two parts: the first part included a semistructure proforma to collect sociodemographic details and details of the hypertension status and the second part included Tamil language validated Short Form-12 (SF-12) questionnaire. The SF-12 is also validated across various chronic diseases. The study tool was pretested among general OPD patients attending the UHTC. SF-12 is a validated tool for the assessment of HRQoL and has 12 items in 8 domains of quality of life., These domains include physical functioning – 2 items, physical role – 2 items, bodily pain – 1 item, general health – 1 item, vitality – 1 item, social functioning – 1 item, emotional role – 2 items, and mental health – 2 items. These domains were further grouped into physical component (physical functioning, physical role, bodily pain and general health) and mental component (vitality, social functioning, emotional role and mental health). Four items (1, 5, 6a, and 6b) with negative response were reversed so that higher score in each item is reflective of more positive health. Each domain is transformed into 0–100 scales as per the SF-12 guidelines. The HRQoL was further classified as high level (scores >60), normal level (scores 40–60), and low level (scores <40). The information obtained was entered in Epidata 3.2, and bio-statistical analysis was done using SPSS 20.0 (IBM SPSS Statistics for Windows, Armonk, NY: IBM Corp). Comparison of quality of life scores in different domains between study and comparison group was done using unpaired t-test. The HRQoL level between the two groups was compared using Chi-square test. The p value of <0.05 was considered statistically significant. A total of 101 persons with hypertension and 101 age- and gender-matched comparison participants were recruited. The sociodemographic characteristics of the study participants are given in [Table 1]. Both the groups were comparable with respect to education, socioeconomic status, and type of family. Proportionately more hypertensive and normotensive individuals were using tobacco and consuming alcohol, respectively, in our study population. However, there was no statistically significant association between use of tobacco and consumption of alcohol with the hypertension status. Significantly higher proportion of normotensive individuals was currently married than hypertensive individuals (68% vs. 55%, P < 0.05). 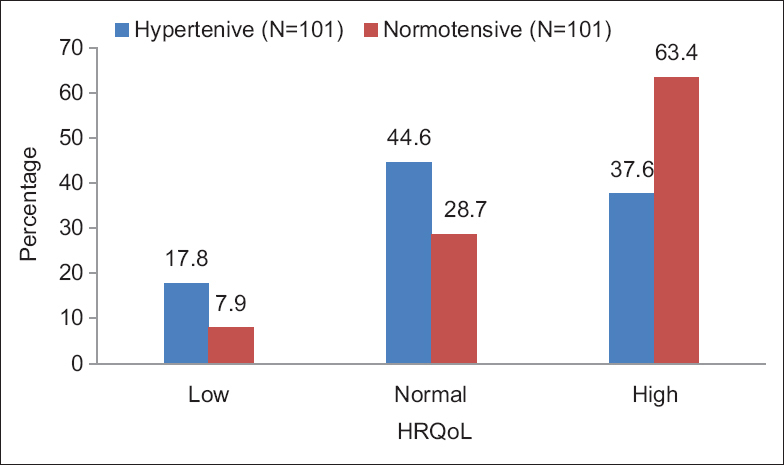 The HRQoL level showed statistically significant association with hypertension status (χ2 = 13.93, P = 0.001) Higher proportion of hypertensive patients (17.8%) had low HRQoL compared to normotensive individuals (7.9%) [Figure 1]. Statistical comparison of HRQoL between the groups is given in [Table 2]. The physical component of HRQoL revealed statistically significant higher scores in the normotensive group compared to hypertensive group in physical functioning, bodily pain, and general health domains. Although statistically not significant, HRQoL mean score was also higher among normotensive group than hypertensive group physical role domain (18.1 ± 10.2 vs. 17.2 ± 11.1, P > 0.05). None of the four domains of the mental component score revealed statistically significant difference in HRQoL score between the groups. However, the HRQoL scores in different domains of mental component were higher among normotensive group than hypertensive group. In this study, we tried to explore the HRQoL of hypertensive patient in our setting considering the limited availability of literature. In our study, all the study participants were aware of their hypertension status. The HRQoL scores were poorer in all domains among hypertensive group than nonhypertensive group in our study. Similar findings have been reported by Bardage and Isacson from Sweden by studying HRQoL among Swedish general population. Our findings were in contrast with findings reported by Katsi et al. who concluded no association between hypertension status and HRQoL. In our study, the physical component score (PCS) showed statistically significant difference whereas mental component score (MCS) did not show a significant differnece between the hypertensive and nonhypertensive groups. Hence, it is inferred that physical component was more compromised than mental component. Similar findings have been reported by Korhonen et al. They have found the mean PCS and MCS scores to be 44 and 53.2, respectively. In contrast, Bhandari et al. from Nepal reported poorer MCS score (38.7) compared to PCS scores (48.2). Soni et al., by examining the original research articles published since 2010 on HRQoL in relation to hypertension, reported poor HRQoL among hypertensive with profound effect in physical functions domain. Khaw et al. also reported significant poor HRQoL in physical domains and smaller reductions in mental domains. Most probable reasons for smaller nonsignificant difference of HRQoL could be the psychological adaptation of patients to the disease, adequate family support, and counseling by the health-care providers. 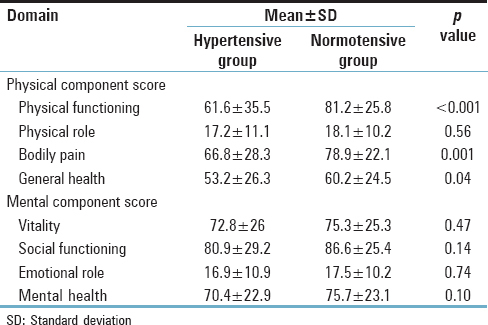 In our study, physical functioning, bodily pain, and general health domains of HRQoL showed statistically significant poor HRQoL scores among hypertensive groups compared to nonhypertensive groups. Mena-Martin et al. also demonstrated similar poor HRQoL among hypertensive groups, especially in physical functioning and general health domain. Hypertensives have poor quality of life than nonhypertensives. Since hypertension is a lifelong disease, adequate control is important to improve the HRQoL. A study from Nigeria has demonstrated improved HRQoL among hypertensive individuals whose blood pressure is under control than those whose blood pressure is not under control. It was an analytical study with matched comparison group. We recruited hypertensive individuals from NCD clinic of the UHTC and age- and gender-matched nonhypertensive individuals from the community who were not having any other chronic diseases. The study participants were selected from a specific area of Puducherry. Hence, interpretation and generalization should be done carefully. The HRQoL was poor among hypertensive individuals and more significantly in physical component domains in the study population. The hypertensive individuals form a vulnerable population and merit focused attention by the health-care providers with respect to disease management to improve their HRQoL. This study was conducted as a part of training of medical interns on community-based research during their posting at UHTC. We thank all the interns and Dr. Manikandan S posted at the UHTC during the study period for their help in data collection. World Health Organisation. NCD Global Monitoring Framework. Geneva: World Health Organisation; 2015. Available from: http://www.who.int/nmh/global_monitoring_framework/en/. [Last accessed on 2018 Sep 10]. World Health Organisation. Cardiovascular Diseases (CVDs). Geneva: World Health Organisation; 2016. Available from: http://www.who.int/mediacentre/factsheets/fs317/en/. [Last accessed on 2018 Sep 10]. Franklin SS, Wong ND. Hypertension and cardiovascular disease: Contributions of the Framingham heart study. Glob Heart 2013;8:49-57. Bromfield S, Muntner P. High blood pressure: The leading global burden of disease risk factor and the need for worldwide prevention programs. Curr Hypertens Rep 2013;15:134-6. Kar SS, Kalaiselvi S, Archana R, Saya GK, Premarajan KC. Is rule of halves still an occurrence in South India: Findings from community-based survey in a selected urban area of Puducherry. J Postgrad Med 2017;63:232-6. Deepa R, Shanthirani CS, Pradeepa R, Mohan V. Is the 'rule of halves' in hypertension still valid? – Evidence from the Chennai urban population study. J Assoc Physicians India 2003;51:153-7. Poljicanin T, Ajduković D, Sekerija M, Pibernik-Okanović M, Metelko Z, Vuletić Mavrinac G, et al. Diabetes mellitus and hypertension have comparable adverse effects on health-related quality of life. BMC Public Health 2010;10:12. Katsi V, Kallistratos MS, Kontoangelos K, Sakkas P, Souliotis K, Tsioufis C, et al. Arterial hypertension and health-related quality of life. Front Psychiatry 2017;8:270. Shinohara Y; OASIS Study Group. Factors affecting health-related quality of life assessed with the SF-36v2 health survey in outpatients with chronic-stage ischemic stroke in Japan – Cross-sectional analysis of the OASIS study. Cerebrovasc Dis 2010;29:361-71. Mena-Martin FJ, Martin-Escudero JC, Simal-Blanco F, Carretero-Ares JL, Arzua-Mouronte D, Herreros-Fernandez V, et al. Health-related quality of life of subjects with known and unknown hypertension: Results from the population-based Hortega study. J Hypertens 2003;21:1283-9. Coyne KS, Davis D, Frech F, Hill MN. Health-related quality of life in patients treated for hypertension: A review of the literature from 1990 to 2000. Clin Ther 2002;24:142-69. Bardage C, Isacson DG. Hypertension and health-related quality of life. An epidemiological study in Sweden. J Clin Epidemiol 2001;54:172-81. Côté I, Grégoire JP, Moisan J. Health-related quality-of-life measurement in hypertension. A review of randomised controlled drug trials. Pharmacoeconomics 2000;18:435-50. Ramanath K, Balaji D, Nagakishore CH, Kumar SM, Bhanuprakash M. A study on impact of clinical pharmacist interventions on medication adherence and quality of life in rural hypertensive patients. J Young Pharm 2012;4:95-100. García-Fabela L, Melano-Carranza E, Aguilar-Navarro S, García-Lara JM, Gutiérrez-Robledo LM, Avila-Funes JA, et al. Hypertension as a risk factor for developing depressive symptoms among community-dwelling elders. Rev Invest Clin 2009;61:274-80. Elias MF, Dore GA, Davey A, Robbins MA, Elias PK. From blood pressure to physical disability: The role of cognition. Hypertension 2010;55:1360-5. Mann I, Singh N, Manisha, Gupta AK, Matreja PS. Assessment of the health related quality of life in patients suffering from hypertension and diabetes mellitus: A cross sectional study. Ann Appl Bio Sci 2016;3:A16-21. Korhonen PE, Kivelä SL, Kautiainen H, Järvenpää S, Kantola I. Health-related quality of life and awareness of hypertension. J Hypertens 2011;29:2070-4. Moum T, Naess S, Sørensen T, Tambs K, Holmen J. Hypertension labelling, life events and psychological well-being. Psychol Med 1990;20:635-46. Varughese J, Jayakumari S. A prospective observational study on health related quality of life of chronic obstructive pulmonary disease patients based on severity. Asian J Phrm Clin Res 2017;10:244-7. Gandek B, Ware JE, Aaronson NK, Apolone G, Bjorner JB, Brazier JE, et al. Cross-validation of item selection and scoring for the SF-12 health survey in nine countries: Results from the IQOLA project. International quality of life assessment. J Clin Epidemiol 1998;51:1171-8. Ware JE. SF-36 & SF-12. Available from: https://www.promotingexcellence.growthhouse.org/tools/pe1268.html. [Last accessed on 2018 Sep 10]. Bhandari N, Bhusal BR, Takma KC, Lawot I. Quality of life of patient with hypertension in Kathmandu. Int J Nurs Sci 2016;3:379-84. Soni RK, Porter AC, Lash JP, Unruh ML. Health-related quality of life in hypertension, chronic kidney disease, and coexistent chronic health conditions. Adv Chronic Kidney Dis 2010;17:e17-26. Khaw W, Hassan S, Latiffah A. Health-related quality of life among hypertenive patients compared with general population norms. J Med Sci 2011;11:84-9. Ogunlana MO, Adedokun B, Dairo MD, Odunaiya NA. Profile and predictor of health-related quality of life among hypertensive patients in South-Western Nigeria. BMC Cardiovasc Disord 2009;9:25.